I like to think that my writing has been successful; certainly publishers are regularly pleased to add my titles to their lists. I have received good reviews and regular contact with readers suggests that my books have helped people, which has always been the aim. Many books are used as resume material for course delegates. But my business books inhabit a specialist area and I wanted to write what my daughter calls “a proper book”. I have always loved travelling and have enjoyed a good deal of it on business and pleasure, so travel writing seemed a fun objective. 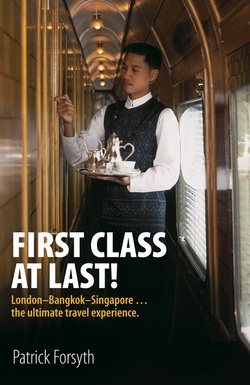 The first is "First class at last!" One reviewer praised it saying it is: “… lively, witty and wry” Select Books. This contrasts budget and first class travel and features a journey on the Eastern & Oriental train which runs from Singapore, through Malaysia to Thailand. My second travel title is very topical. 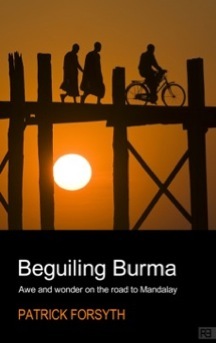 Beguling Burma is available now, published at £9.99, but can be ordered from this website (see details on the right for how to order) at a special price of £9.99, post free. Burma (or Myanmar as it now called) is in the news for all the wrong reasons. It has been ruled for many years by a ruthless, repressive junta, it suffers regular earthquakes and the cyclone of May 2008 left more than a hundred thousand people injured, homeless or dead. Yet this is a magical place: a country of contrasts with a rambunctious history and a culture that is both awesome and fascinating. Largely on a whim, prompted by sitting next to the “neighbour from hell” on a long-haul flight, the author decides to visit Mandalay, the “Golden City” foreseen by ancient Buddhist prophesies. Despite controversy – there are campaigns suggesting you do not travel to Burma on the grounds that doing so supports the government - he makes a trip, flying to Bangkok and on to Yangon (previously Rangoon) and makes much of the journey on the river cruiser "Road to Mandalay" sailing along the famous Ayeyarwady. Along the way he encounters taxis pulled by oxen; rings the largest bell in the world; learns how to wear a skirt, the difference between a stupa and a pagoda and why florescent pink tiles are used in temples. In this lively and light-hearted account of his journey he watches the best sunset in the world on the plains of Bagan, and as the sun sinks behind the towers of pagodas stretching in countless numbers to the horizon, concludes that this wonderful country is worthy of everyone’s attention, and perhaps help too. Ordering: Copies may be ordered here. See details on the right on how to order my books. There is no VAT on books. NOTE: I give talks about my travel writing: amusing and of interest to writing groups and bodies such as Rotary; details on request.